Rolls-Royce motor cars are the poster child for expensive, pretentious automobile brands. They aren’t the fastest (certainly) and they may not even be the best (depending on how you define that). They clearly are a symbol of conspicuous consumption, and they’re exclusive – having dealers in only the wealthiest locales. At the other end of the spectrum may be a car like the Toyota Yaris: thrifty, unpretentious in the extreme; but it reliably if not stylishly gets one to his destination, and is readily available at your nearby Toyota dealer. I would consider Williams brand to be the Yaris of shave soaps. Unpretentious, inexpensive, no frills, merely a most basic item and readily available at many local retail stores – usually pharmacies. The oft-venerated brand of shave soap at the other end of the spectrum – the Rolls-Royce, if you will, of shave soaps – may well be the Martin De Candre (MDC) marque from France. For 200 grams (about seven ounces) of MDC, you will pay either $79 or $89 (depending on the fragrance you choose) plus shipping costs. Ignoring shipping costs, its average price is $84 for 200 grams. Williams, on the other hand, can be had for $1.50 (perhaps even less) to about $3 at a retail store . So I’ll roughly estimate the average cost of Williams to be about $2.25 for 50 grams. Therefore, 50-grams of Williams comes in at USD$2.25 and MDC at USD$21.00. So,neglecting shipping, MDC is almost ten times more expensive than Williams! Every shave began with about a half cup of water in a re-purposed Greek yogurt container. I would pop this in my kitchen microwave and heat for a minute. (The #5 plastic used for these containers, polypropylene, is heat resistant and excellent for microwave heating, dissolving or melting purposes.) I would then walk my hot water into the bathroom for my morning shave. I used an Omega Syntex brush for all my shaves. I would fully immerse the brush bristles into the water, draw it out, wait a couple of seconds for the excess water to drain out, then give it a single downward shake to remove additional water clinging within the knot. Then I would load the brush with soap by swirling the Syntex in the soap container. I would generally swirl the warm brush on the soap until I felt a slight increase in swirling resistance, which indicated that there was enough soap in the brush to make a rich lather. The soap containers were also re-purposed Greek yogurt cups. The somewhat unique aspect of my shave soap use is that for a very long time I’ve re-used lather. A few years ago after my daily shave, I started squeezing the excess clean lather from my shave brush back into the soap-storage container and let it dry. I found that not only was this a thrifty habit, but it also made loading the brush with soap easier in subsequent shaves. Then later, from a vintage printed Gillette shaving tip, I acquired the habit of not even rinsing the excess lather from my shave brush and simply hanging the lather-filled brush to dry over night. (For the next shave, I would lay the side of the dried-lather brush in my damp, cupped hand to wet the wispy dried-lather remnants so they didn’t fall off or float away on some minor air current.) This practice of not rinsing the brush after the shave worked very well for those periods when I would use the same shave soap for many days in a row. If I changed soaps and didn’t want to mix fragrances, then a return to my previous process was called for, which was squeezing out excess wet lather and rinsing the brush clean before hanging to dry. So because I was switching between Williams and MDC daily, it was obviously necessary to use my older squeeze-and-rinse brush process after every shave. Once my brush was adequately loaded with soap, I would make lather directly on my face; I don’t typically use a dedicated lathering bowl – an accessory that I abandoned years ago as unnecessary. I also did not do anything to prepare my beard prior to the initial lathering – no hot water splashes, no hot towels, no pre-shave wash.
Then after my initial face lathering, I would take a few seconds to lay out my additional shaving gear: dry wash cloth, razor with blade already inserted from the previous day, a square of toilet tissue, and blade wrapper with pencil for recording the day’s shave usage. That done, I dipped the shave-brush tips back into the warm water, and face lathered again right on top of the previous lather. Then I was ready to shave. My razor-stroking is different from the standard recommendations. I use reciprocating shaving strokes – that is, rather long buffing-type strokes. This tends to re-spread lather onto a just-shaved area. I also shave in an anti-raking direction, meaning that instead of shaving into the lathered area so that most of it is removed during a pass (as one would rake leaves off a lawn), instead I shave away from the lathered areas, which tends to leave relatively more lather on the face. This combination of buffing strokes and anti-raking pattern leaves sufficient lather on my beard to allow multiple strokes (from multiple directions) in any given area of my beard. This means that I often remove more beard than most others do following a single lather application. Therefore I generally only lather twice during a close shave. After the second-lathering shaving is complete, I make final clean-up strokes after simply adding water to any remaining lather on my face; this is adequate to shave safely while being able to feel areas that are not smooth enough to satisfy. The water in my area is hard, meaning it’s full of minerals (but not iron). It tastes pretty good (unlike distilled water), but isn’t optimal for slickness. Anyone who has showered in both hard water and softened water knows the dramatic difference in slickness between the two. So for this shave-soap comparison, I shaved for a couple of weeks using my hard tap water to make lather. Then I purchased a gallon of distilled water (because it’s mineral free), and used that for my daily shaves for another couple of weeks. Throughout the entire testing period, I rinsed the used lather and stubble from my razor using tap water, and then dipped the razor into the warmed water for shaving comfort (for the warmth, that is). It should be noted that both soaps were stored for (at least) weeks in the open air (within a drawer). This caused them to lose moisture and fragrance, becoming firmer and with a weaker bouquet. I note this because the soaps may lead to conclusions different from mine, when the soaps are fresh from their factory packaging. Related Post: What Is The Best Shave Soap? Regarding the specific aspects of soap performance, I considered ease of loading the soap onto the brush, which can be impacted by soap’s consistency – that is, a hard puck versus some softer formulation due to water content or the use of some amount of KOH (potassium hydroxide) during the soap-making process. I also considered the ultimate creaminess and richness of the lather and the difficulty of achieving that ultimate state. Because I have rather long shaving stints for a given lather application, the time that the lather stayed adequately moist was also something that I observed. And finally, the slickness of the lather was something I noted – both during the main-shaving phases of the first and second lathering as well as the post-lathering clean-up strokes just using water added to any residual lather. Before I share my observations, I must add a word about perception. As a university-trained dietitian, I have a lot of training in science. This includes experimentation and observation. I was also university educated in marketing prior to my dietetic training. Marketing students are schooled in the sciences and arts of polling, marketing research, observation and perceptions. The net take away from all my experience is my understanding that it’s very hard for human beings to be objective. Their preferences, aversions, and opinions in general are often (usually, almost always) prejudiced. These prejudiced opinions regarding products (in this case) are influenced by personal experience, previously received information from others (including misinformation), pricing, packaging, and other factors. Soap performance in hard versus distilled water: I didn’t perceive and difference in any aspect of soap behavior or performance related to using hard versus distilled water. Ease of loading the brush initially with soap: All the trials were with warm water, and there was no significant difference in brush loading that I could perceive between the two soaps. Ease of face lathering: Both soaps began with watery and thin lather that ultimately became adequately creamy and rich. The MDC may have achieved that final, usable state a bit more quickly. However, the difference (if any) in the time to get there may be measure in seconds, not minutes. Quality of ultimate lather: The MDC may have produced a slightly richer lather. If so, not much. If I took the extra seconds to work the Williams into its best lather, I found that to be rich and creamy as well. Moisture retention of the lather: The MDC gets the nod here, but only by a nose – and probably not significantly. Because I make a lot of razor strokes after a given lather application, I did push the moisture-retention capabilities of both soaps. The bottom line is that for both soaps I often had to dab on some additional water into the final remnants of lather, or simply dip the brush tips in the water and add a bit of lather for the final strokes of any given lathering phase. Slickness of the lather: Both soaps were slick. I haven’t perceived any significant difference. Residual slickness for added-water clean-up strokes: Both soaps had very good slickness, when simply adding water to residual lather for final clean-up strokes. As an admittedly jaded and cynical former marketer, I have learned to distrust price as an indicator of quality as well as brand image as representative of actual reality. That said, here are my conclusions in my weeks-long evaluation comparing MDC and Williams, respectively (and arguably) the Rolls-Royce and Toyota Yaris of shave soaps. Related Post: High-Priced Shaving Creams/Soaps: Worth It? I have concluded that image isn’t reality in this case. A kind, fellow wet shaver provided my MDC sample as a premium option – the best, if you will, peerless among shave soaps. But that was not my experience. I found very little difference between “the best” shave soap and one of the most humble. Bouquet aside (and there was very little difference once both had aired out for a time), I really didn’t see enough difference to justify using one soap over the other – except for price, of course. Would I pay 10% more for MDC? Only if I really liked the fragrance. Would I pay twice as much for MDC? Unlikely. Would I pay ten times more for MDC? Not a friggin’ chance. I must say that this comparison test has caused me to view Williams shave soap in a new and more respectful light. I had previously relegated it to a place with the also-rans, the not-quite-worthy soaps. But I was wrong. Yep, Williams is inexpensive. Yep, Williams doesn’t have a fashion-designer bouquet. Yep, you can often purchase Williams at your local drug store beside Aqua Velva and Gillette after-shave balm. It isn’t pretentious. It isn’t exclusive. But Williams (from the corner store) is, for all practical purposes, pretty much as good as Martin De Candre (from the continent – spoken in a haughty voice and with nose in the air). And when I look at the value, Williams seems to be far superior – just my hard-headed, practical-yankee two cents. Have you tried both Williams and Martin de Cadre shave soaps? What do you think? Leave a comment below! I have used many soaps in the last several years and find MDC to be one of best for lathering ease. The fragrances are terrific and not overdone. I still have a my jar from several years ago. I bought a puck of Williams a few years ago just to try it. I had tried Arko and other inexpensive ones that worked well, but never had the rich lather of MdC. Williams, on the other hand was difficult for me to even get a thin soapiness. I saw a review on this site a while back about Proraso soaps being difficult to lather and not very good. Proraso has been around a long time and as a beginner wet shaver I used it and found it easy to lather and made rich lather. It is a very reasonably priced soap or cream that lasts a good while, if one wants to go cheaper but with good value. i used modern williams with a wilkinson brush for 10 years, did the job.but routine and boring..i like the middle road artisan soaps,more fun to play with, a little color ..what does one look for in a shave soap? price doesn t always mean quality.. Such a huge drama was not required. The very first statement “Rolls-Royce motor cars are the poster child for expensive, pretentious automobile brands” reflected his opinion about MDC. I am happy that you no longer say ” coughWilliams cough.” I have used Williams for quite a long time. If you soak it with the brush for at least five minutes, it matters up fine. It matters quicker using hot water vice cold water. The cold water lather ultimately the same. I haven’t used Martin, but I use WSP Formula T when traveling. I use a lathering bowl and badger brush. I see little difference in performance. Williams costs $0.99 plus tax and lasts 38-40 shaves. The WSP synthetic works equally well with both soaps. Awesome review – keep up the good work. The comments are hysterical. Looks like some MDC fanboys got a wee bit butthurt. I’ve tried both soaps – I’ve used two jars of MDC over the years actually. At some point I may try the fern fragrance but there really is no pressing need for me to do that. MDC is fine, good even. But there are many many other soaps that cost way less, last much longer and many of them actually do a notably better job. Williams is good also, the performance is on-point too. But, for me, almost nothing beats it on price or availability. Price wise, its 40 cents a gram vs 3 cents a gram. I’ve checked my usage and I use about 1 g of either per sitting. I recently piced up some nice artisnal soap at $0.17 a gram and I like it a lot more than MDC. I’ll put this Williams soap on my list. I don’t need luxuries, just a good shave. My comments are similar to those of “The Dean.” Your so-called scientific method is fatally flawed. I have tried both soaps. First, although MdC may be expensive it lasts a very long time. I get hundreds of shaves with MdC while I get about 35 with Williams. I bought my first jar of MdC about five years ago and put it in my regular rotation of using one soap for a week. The MdC lasted five years while some other soaps such as MWF, AoS, Panna Cremma, B&M, as well as others were long gone. So, to really use your expense formula you should use it over the life of the soap. Otherwise, your comparison is meaningless. 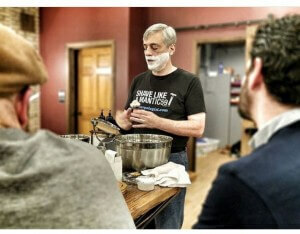 I have been a traditional shaver for more than 45 years and have tried perhaps dozens of soaps. I belong to three different shaving forums. On each forum, there are many folks who complain about the difficulty of getting a good lather from the modern Williams shave soap. People complain about it drying up on their face. Some have to add cream to be able to use the soap. I have never heard of a single person who could not get a decent lather with MdC. My personal opinion of Williams is that the vintage Williams was excellent but clearly a step below the modern version. The original Williams is what I started shaving with and I was disappointed when they changed the formula. From your criteria I assume your favorite soap is Arko. This blog is ridiculous! It’s just shaving soap. Buy what you want and can afford. We don’t all have to be cheap like you Doug. Not everyone wants to use Williams and Arko for the rest of their shaving life. Lighten up. Its just shaving we make this ritual such a big deal. I blame most of this on all the forums and sites like this one. I can’t dispute your conclusion that MdC is not ten times better than Williams. For the record, I’ve never tried MdC and I think Williams is marginal (by itself) as a shave later. But I have found “luxury” items rarely perform at the same ratio as their price differential (at least when compared to the better “standard” products). But I’m troubled by a couple issues in this “test”. First of all, let’s dispense with your pseudo-scientific explanations. No test using a sample of one can be the least bit scientific. This wasn’t a blind test. There was no defined scale for evaluation, etc. At best, even if better methodology was employed, the results could only be generalized to, well, YOU. This is (as nearly all product reviews are) a purely subjective evaluation. But I think the thing that bothers me the most, in this case, is you evaluated these lathers using a (very idiosyncratic) method of prep and shaving. You defined the “box” and then evaluated (subjectively) how these products performed when shoved into that prefined box. When picking products for oneself, there’s nothing really wrong with that. If you are married to a certain routine/method, and have no interest in adjusting it, then it’s more important to find products that perform well for you, given your preferences and restrictions. Another way to go about looking at products would be to find how they perform best—then compare them using the best method for each. In other words, if you adapted to the product, instead of making a square peg fit a round hole, you might have reached a different conclusion. I’m not suggesting you actually do this for yourself. I also tend to use products that fit the way I prefer to shave. Just be aware how limited the relevance of your review is for others, who may prep/shave using dramatically different methods.